Bauhaus have been called the Godfathers of goth, and I don’t know anyone who will argue this. Everyone may think they are unique in their style and sound, but something always inspires us to be what we are. Bauhaus has been that something that has inspired many others in the goth, industrial, rock, and alt scene. It is hard to believe that Bauhaus is celebrating 40 years. Bela Lugosi’s Dead, which was released in 1979, is the pinnacle of goth rock. The excitement of being able to cover the 40 Years of Bauhaus Tour was overwhelming, but like a good goth kid, I kept smiling to a minimum. Who am I kidding, I was smiling ear to ear for this one. 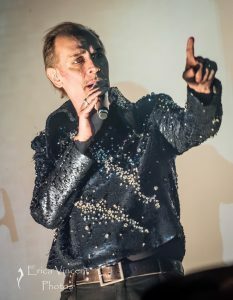 I had seen Peter Murphy several times over the years, but this show was an anniversary tour, and founding member and legendary bassist David J. (David Haskins) was on the tour, I knew this show was going to be one for the books. Opening for Murphy was Desert Mountain Tribe from the U.K., and what a treat they were. This psych-rock trio is one to have on your radars, I am excited to see more of this band. Following was the curious Vinsantos DeFonte. Vinsantos I was familiar with his art and drag performances, but to my surprise, this queen can sing and will have you laughing so hard, your facelift will reverse. One of the stories told in between songs was Vinsantos growing up, and how all jocks and preps are the same. I won’t ruin the punchline on this one, just go see for yourself, and be prepared to cry from laughter and awe. The set was completed with Pete Murphy surprising Vinsantos on stage for one last song, and duet. The stage fell into darkness, and figures begin to appear one by one., always a heart-stopping moment. The lights come on, and the show is underway with one of my personal favorites Double Dare. Before I know Peter Murphy is within arms distance from me and my camera, I had to keep reminding myself that I only had 3 songs to capture this moment. Before I knew it, my 3 songs were up, and I could relax and enjoy the remainder of the set that was rumored to be close to 2 hours. Murphy still has so much energy and passion on stage, wandering side to side, engaging the crowd, using props that make the concert borderline a theatrical performance to the songs. David J. (bass) played the set in his standard suit and shades. Immediately with the set opener Double Dare the deep and soul cutting sounds of David’s bass will capture you. Mark Gemini Thwaite (MGT) was on guitar for this tour, and as always is a delight to watch. The heavy distorted guitar combined with Murphy’s voice is a combo that can’t be beaten. Marc Slutsky rounded out the band on drums. Slutsky is no stranger to the touring world, his play history is impressive, and watching him live it is easy to see why so many bands ask him to tour. The set included everything I could have wanted to hear, In the Flat Field, St. Vitus Dance, Nerves, Adrenaline, Adrenaline, and the infamous Bela Lugosi’s Dead. Before I knew it, the 2 hours was almost up, and the band leaves the stage. The crowd, of course, demanded an encore, and Murphy was more than happy to oblige. Finishing off an already amazing set with Kick in the Eye, Telegram Sam, and one close to my heart Ziggy Stardust. Typing that just sent shivers down my spine. Sadly the tour is closing out, with a few makeup dates in San Francisco, and a few other random shows. I hope you all were able to catch this amazing tour when it passed through your town, I know almost every show was sold out. If not, I know Murphy will be back out on the road again, making the underworld dance and smile endlessly.